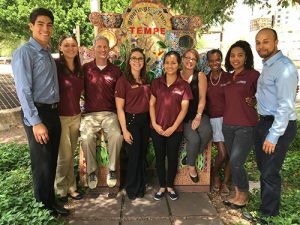 The Community of Graduate Scholars (CGS) is a year-long, one-credit course that brings together the paid Research Assistants working under the supervision of investigators at the Decision Center for a Desert City. The course gives our Graduate Research Assistants the opportunity to gain skills and become leaders in transdisciplinary approaches to research, policy, and community engagement. Each CGS student works on a research team that includes faculty members as well as graduate and undergraduate students; this collaborative environment provides them with the intellectual depth necessary to contribute to DCDC’s research. The program is structured to build dialogue, thought, and action across disciplines. As a part of CGS, students have the opportunity to participate in the annual conference of the American Association for the Advancement of Science, among other professional networking and skill-building activities. Through this program, we apply mentoring that embodies six core competencies, as outlined by the National Postdoctoral Association (NPA, 2014): 1) discipline-specific conceptual knowledge, 2) research skill development, 3) communication skills, 4) professionalism, 5) leadership and management skills, and 6) responsible conduct of research. Danielle Chipman, pursuing her Ph.D. in Sustainability. 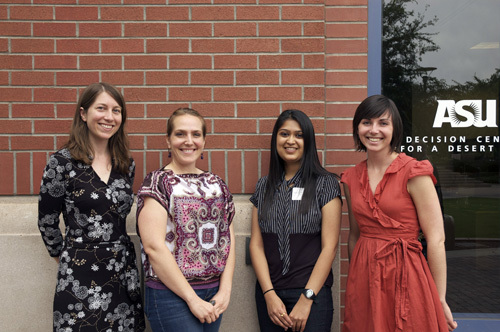 Christine DeMyers, pursuing her Ph.D.
Leah Jones, pursuing her Ph.D.
Krista Lawless, pursuing her M.S. Brandon Ruiz, pursuing his M. S. in Urban Planning. 2017 AAAS Poster. Zoë Stein, pursuing her M.A. Ruby Upreti, pursuing her M.S. in Civil, Environmental, and Sustainable Engineering. 2017 AAAS Poster. Danielle Chipman, pursuing her Ph.D. in Sustainability. 2016 AAAS Poster. Thuy Nguyen, pursuing her M.S. in the School of Sustainable Engineering and the Built Environment. 2016 AAAS Poster. Rhian Stotts, pursuing her Ph.D. in Anthropology. 2016 AAAS Poster winner of the 2016 AAAS Student Poster Competition in the Social Sciences category. Charlotte Till, pursuing her Ph.D. in the School of Human Evolution and Social Change. Ruby Upreti, pursuing her M.S. in Civil, Environmental, and Sustainable Engineering. 2016 AAAS Poster. Yujia (Cindy) Zhang, pursuing her Ph.D. in Geographical Sciences. 2016 AAAS Poster.